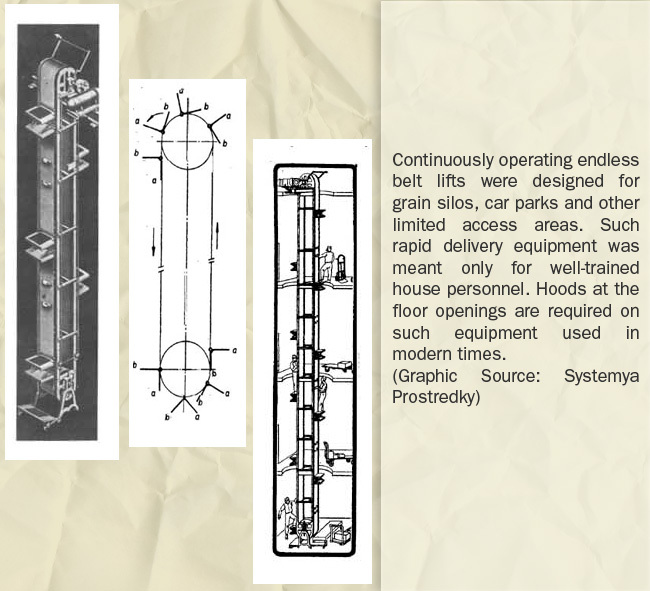 Probably, the reciprocating rods used in the early mines were the first system for moving men both vertically and continuously. A number of miners could be taken up and down a mineshaft at the same time. And when goods and/or passengers were transported in a wagon, it must have been obvious to all that the continuously rotating wheel was a most efficient means of locomotion. 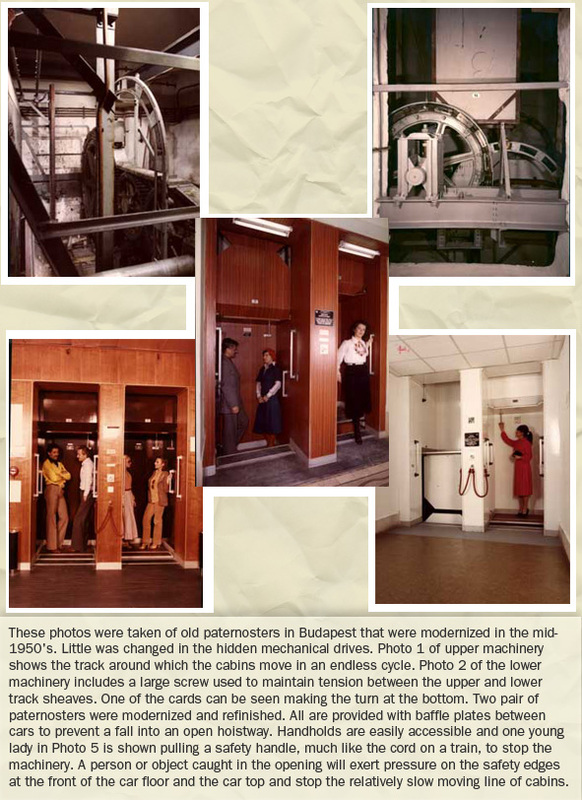 It was therefore logical that when the time came to move passengers vertically in a heavily-populated multistory building, thoughts turned to a conveyor belt passing over a wheel and moving passengers continuously. Such a device was invented in England and given the name of "paternoster" or "Our Father." The similarity of the string of cabins to the beads on a prayer rosary was obvious, but potential riders may have considered that the hazard of nimbly transferring called for the saying of a few "Hail Marys" and "Our Fathers." The endless chain of cabins was quickly adopted on the Continent where the Germans vied with the English in adding safety features. 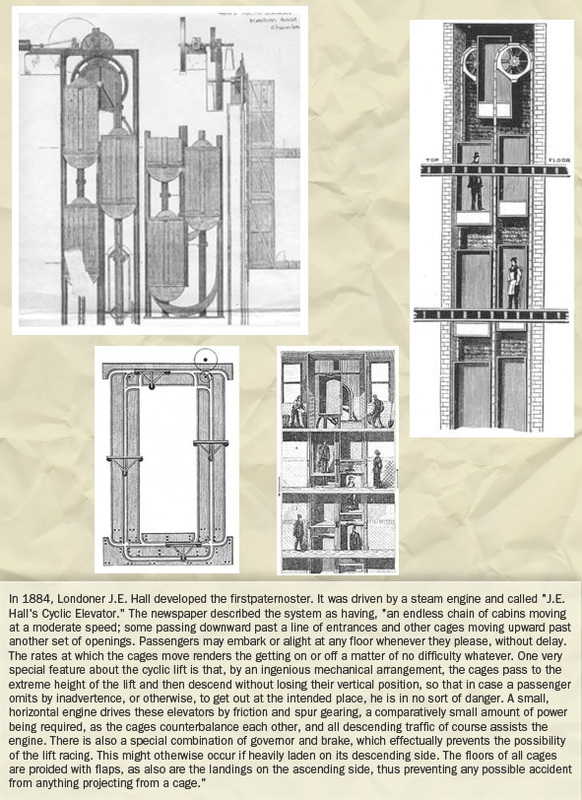 When considered on the basis of "people carried per hour," no elevator could approach the efficiency of the paternoster, and the device proved particularly popular in colleges and military schools where young people took such transportation in their stride. 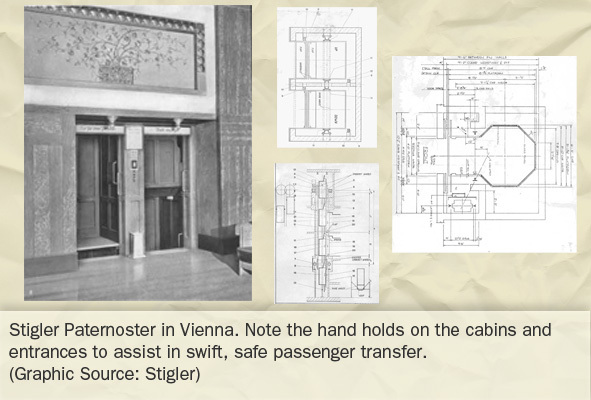 Employees were inexpensive in those days, and hotels utilizing the paternosters may have provided assistance to those boarding and alighting. In modern times, elevator control systems requiring a period of familiarization, such as Hall Preregistration of Designated Floor, are most efficient in buildings with a limited number of visitors. It must have been much the same with paternosters; they were most efficient when used by the same passengers over and over again! Endless belt transportation of attendants in present-day parking garages also works well as only a few employees are allowed to ride the continuously moving steps.